Glass, gas masks, and cola — all for the sake of mankind. 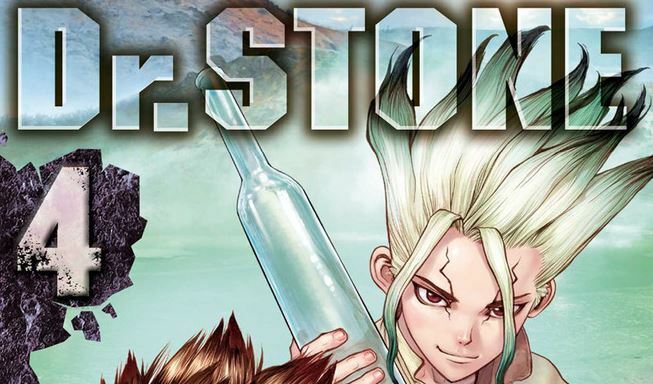 It bears repeating that I am never not stunned at how promptly — how expertly — Dr. Stone picked itself up after its stumbling opening. 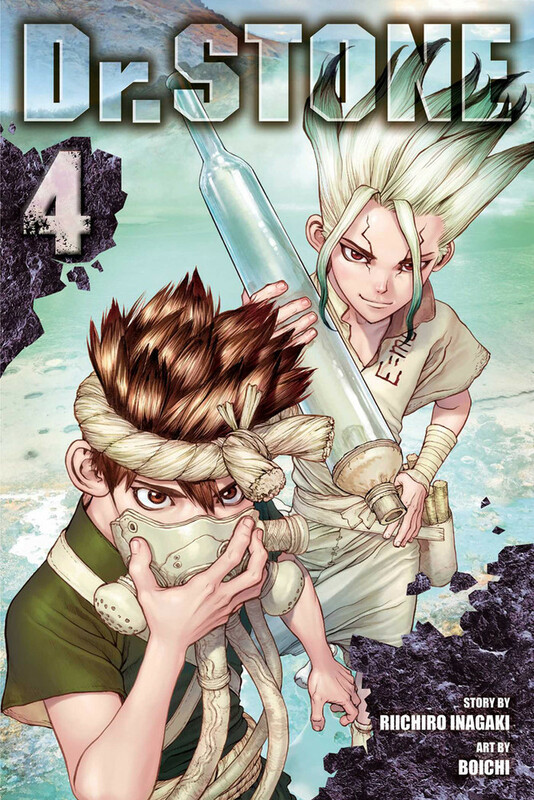 Not that we weren’t aware of Riichiro Inagaki’s storytelling genius thanks to Eyeshield 21, but after how hurried and dysfunctional Dr. Stone‘s first two volumes were, it’s astounding Senku and his band of rustic villagers in Kohaku, Chrome and the gang have already captivated us. Whether Inagaki’s Taiju/Yuzuhira fake-out was deliberate or not no longer matters — as we grin, cheer, gasp, and laugh along at they experiment and tinker through trial-and-error, those of us who dozed off in science class can’t deny what Inagaki’s achieved here: he’s made learning fun. This is hardly saying Shonen and science have never crossed paths; really, as many fans certainly know, those infamous exposition monologues deliberately entail every technicality behind a sudden development in battle. (Looking at you, Jojo’s Bizarre Adventure!) 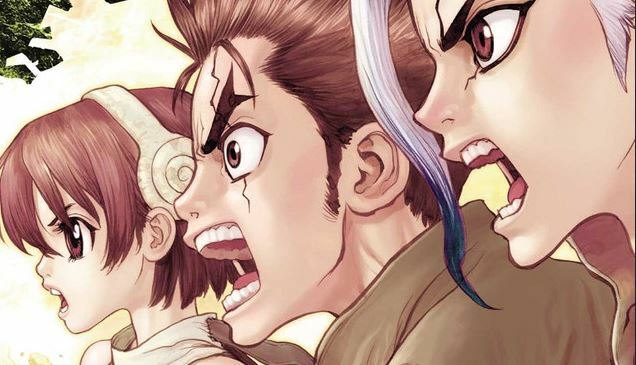 Detractors exhausted from such suspension of disbelief will find Dr. Stone a much-needed bag of fresh air, as I can hardly recall anything devoted to such earnest edutainment. With science beating at its core, it’s no mere means to an end in filling up panels, but instead re-inventing the stepping stones of history to revive our cast’s petrified world. Granted, this was also Dr. Stone‘s opus morandi during the Tajiu era, but the superstitious villagers are no yes-men –they complement his “sorcery” with wonder, with fear, and yes, actual violence. There’s no rushed conflict, no linear path to success, and as best illustrated by Chrome’s confrontation mid-volume, no hailing Senku as an immaculate messiah. They’re real characters, bouncing off each other and questioning their methods to save the world. What’s especially electrifying isn’t how Senku’s ambitions aren’t merely pragmatic in reviving civilization, but how his science draws others. This isn’t referring to our team lighting a fire under old Kaseki’s belly and reinvigorating his passion for craftsmanship; nay, I speak of the adorable Suika, whose apple-covered mask is masking her “fuzzy disease” — in other words, her near-sightedness. The need for chemical storage requires re-inventing glass, but what better way to prove its effectiveness by granting Suika’s near-blindness glasses? Like actual chemistry, a chain reaction forms — Ginro’s newfound courage is only possible through Kaseki’s re-sparked devotion, which in itself was revived through Senku’s public lead display. For all his teasing and jabs, merely witnessing Suika’s double-spread re-awakening unveils Senku’s beating heart — his appeals to their faults and interests aren’t cynical exploitation for the sake of science, but genuine avenues into quality of life and becoming better individuals. What better application of science can we ask for? Breathing hydrogen sulfide is very bad. Still, not everything’s hunky-dory friendship — Gen Asagiri, a young magician from Senku’s time, adds a dynamic wildcard to Dr. Stone, what with his wavering allegiance between Senku and the murderous Tsukasa. Yet while this Volume 3-born stand-off only lasts for this iteration’s first chapter, it’s perhaps its most vindictive. That a relationship built on something so tenuous — let’s just say it involves Gen’s favorite beverage — ends up producing a drop of necessary cynicism: sad as it may be, many individuals operate only for their own interests, even said interests blatantly work against humanity’s best interests. 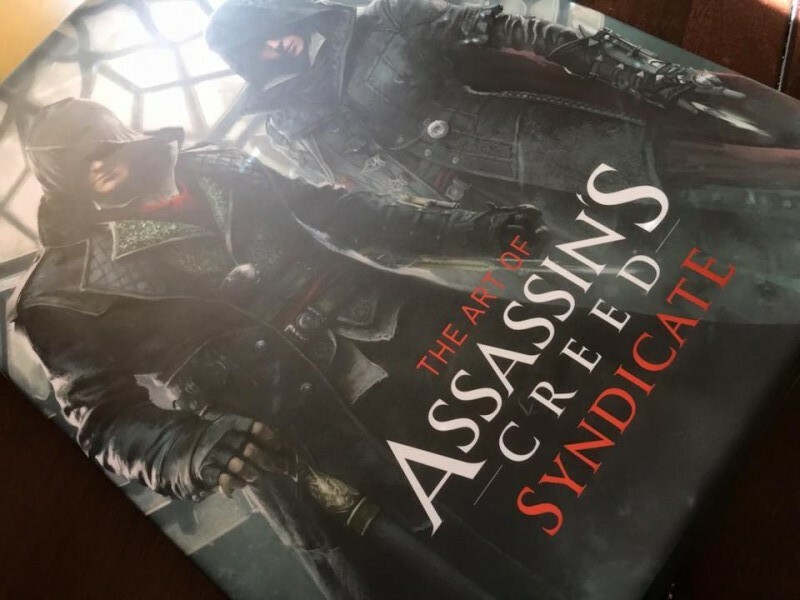 We may witness a change of heart for Gen down the line, but regardless, that his ensuing fealty isn’t bound by any sort of supportive camaraderie presents a much-needed representation of the morally gray. 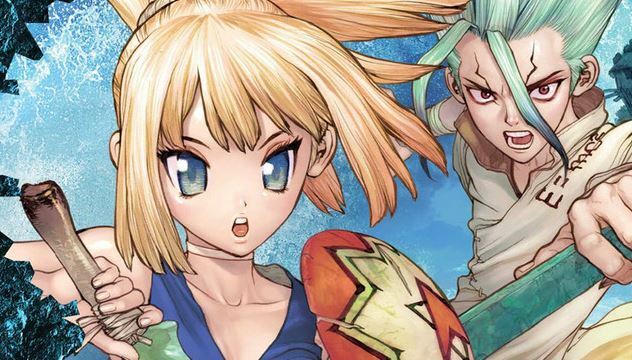 With not just Ruri’s life hanging in the balance but a tantalizing mystery hanging over this Grand Bout, Dr. Stone further sinks its hooks into us. Having just returned from reading the latest Weekly Shonen Jump chapter, I’ll keep mum on future events, but I can say this much: have no fear of Dr. Stone jumping the shark. Inagaki and Boichi’s post-apocalyptic is edutainment at its finest, where even the re-invention of cola is framed as a massive step for mankind.